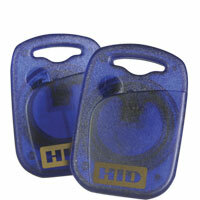 The rugged HID MIFARE Keyfob is ideally suited for a variety of applications and environments. These include vacation resorts, health spas, apartment buildings, club houses, as well as commercial offices where photo IDs are not required. The RF-programmable keyfob features the high quality and security benefits customers appreciate in HID FlexSmart 13.56 MHz MIFARE credentials. The Keyfob permits the encoding of a wide range of data and information. Securely separated sectors, each protected by a set of two keys and programmable access conditions, allow complex applications and provide for future expansion. 1.725" x 1.197" x 0.215"
MIFARE 1K: memory arranged in 16 64-byte sectors. MIFARE 4K: memory arranged in 40 sectors: 32 sectors of 64 bytes, 8 sectors of 256 bytes.